I was flying from Colorado to Tampa when the guy sitting in front of me, 11 C to be exact, decided to settle for a nap. Crunch. With a violent shove, the back of his seat smashed down on me, my knees, and my brand new laptop, without so much as a second thought. I could’ve used the Jaws of Life to extricate my laptop from the jam, or perhaps the assistance of the flight attendant, who ignored my predicament with an indifferent shrug. For the rest of the flight, I stared at the man’s balding pate, practically laying in my lap. Score one of the gods of mischief. 11 C unhinged both my laptop and my muse. It wasn’t always like this. I have distant memories of the friendly skies and every once in a while I score a pleasant flight on a carrier that doesn’t charge extra for your suitcase–or your next breath—and still considers smiling an important requirement in their job descriptions. But still, I fly an awful lot and I long for the kinder times where we weren’t all looking at one another as potential terrorists across the aisle and my knees were not bruised after every flight. Don’t get me wrong. I understand the economics about selling more seats per airplane. I’ve also heard about the arguments that Americans are getting bigger vis-à-vis airplane seats. Okay, fine. Let’s stick to our diets, America. But sometimes, when I board a plane and look around me, I suspect that somewhere, someone is playing a joke on all of us. Only miniature elves could fit in some of those narrow, jam-packed seats, and even then, their tiny knees might end up as bruised as mine. As a writer, I do an awful lot of work while in the air. Those hours are vital to my schedule. And while I’m willing to sacrifice my knees for the thrill of the journey, my laptop is sacred. It’s hard enough to work in the cramped quarters as it is, but when 11 C slams down his seat without warning and smacks down my laptop like a swatter on a fly, this usually chill traveler sees red. Which is why I’ve come up with my own rules for flying. Unless the flight is very long, I don’t recline my seat. Period. It maintains an illusion of space and it really helps the person behind me if she or he is using a laptop. If I must recline my seat during those longer flights, I look back to make sure I’m not going to smash the other person’s laptop, device, or carryon dinner. 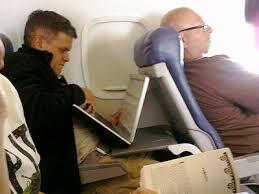 If the person is awake, I inform them I’m about to recline the seat a couple of inches and do so slowly. Did you get all of that, 11 C? It’s called common courtesy and, I promise, it won’t hurt you. BTW–and since we’re talking about writers on planes–maybe we should address one other little tiny issue while we’re at it. If someone is using a laptop or a device near me, I typically avert my eyes from the content. Nothing is more unnerving to a working author than a nosy neighbor peering into one’s half-formed prose. Yeah, I’m talking to you 12 D.
My local airport, Tampa International at sunset. You are currently browsing the archives for the Writing in a plane category.